Gluten free diets are on the rise, and it’s not just a fad. Currently as many as 18 million American’s suffer with a gluten intolerance. This does not include the amount of people who have been diagnosed or are suffering from Celiac’s Disease. Many of the issues I discovered were caused by gluten, I never would have suspected could be caused by a food allergy or intolerance. If you are concerned you may have an issue, or you’re wondering why so many people are opting for gluten free, continue on. I have compiled a list of the main symptoms I experienced. How I was able to pinpoint gluten as the culprit and how you can begin to check yourself for gluten intolerance symptoms. 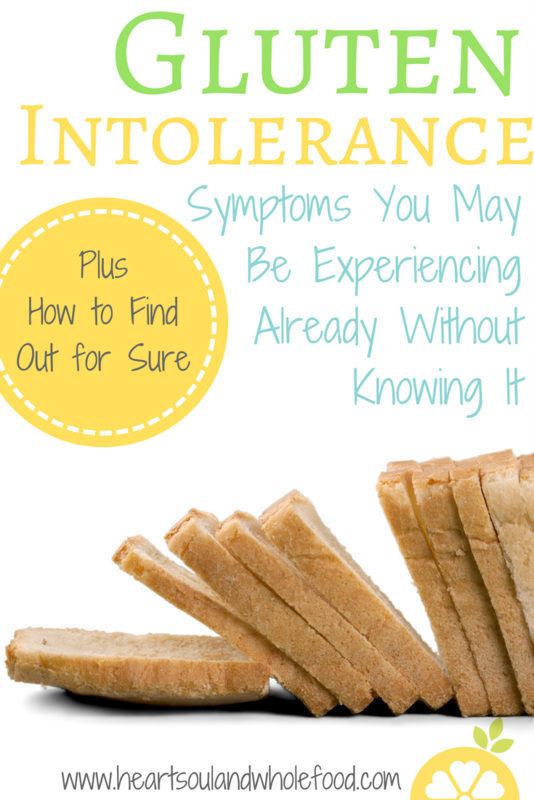 An obvious main symptom of a food intolerance or allergy is usually having stomach complications. This was the first thing to capture my attention as well. After doing a week long juice cleanse, I found myself constantly getting stomach aches after I would eat lunch. We had gone to California to visit family and sitting on the couch with a cramping up and bloated stomach was no way to spend a vacation. If you are experiencing stomach problems, like diarrhea, stomach cramps, unexplained weight loss, constipation or vomiting, my first suggestion would be to try a mono meals diet for a week or two. Taking the time to cleanse and re-start your system could work wonders on your tummy. If after cleaning notice symptoms set in again, DON’T try cutting gluten, even though it could be the culprit for your problems. More severe symptoms like these can often be a sign of Celiac’s Disease. While you can be tested for Celiac’s, you need to still be consuming gluten for test results to show a positive result. If you are experiencing more bloating and slight irritability, doing a gluten elimination diet would be a great place to start. While doing this, I also highly recommend cutting processed foods out of your diet as well. I will talk more about how to begin the “elimination process” at the end. When I started reading about how deeply gluten was affecting people’s mental clarity and alertness, I was sitting at the computer with my jaw dropped. Suddenly a lot more of my struggles were coming to light. I had associated my irritability and mood swings with potential depression. In the last year I had really been living life in a funk. The mornings I would wake up with energy and drive to motivation to go to the gym, it would be quickly taken away. For breakfast I was having organic, clean, whole wheat bread with avocado and an egg on top. A pretty good way to power up any morning. Within an hour, however, I would be so tired I would tell Tom to take the kids to the gym without me and I would fall asleep on the couch! Getting plenty of sleep the night before and having only been awake for a few hours, this was incredibly stressful and very confusing. When I began reading case after case of people who were struggling with similar problems and had them resolve on a gluten free diet, I was totally floored. I will discuss some of the evidence behind the matters later. Tiredness and irritability are one thing, but upon reading more about gluten another big event in my life started to make a lot more sense. One morning I had been driving around with my kids in the backseat. We were looking for a used book store that we go to frequently. The problem was, I couldn’t find it. It wasn’t just that I missed a turn or took the wrong way, I didn’t know where I was going. Scarier yet, it felt like I didn’t know where I was; I felt scared. Not knowing what to do, I just started driving, I didn’t have much other choice. Figuring I would stumble upon where I was trying to go. I have Alzheimer’s disease on both sides of my family tree. My maternal grandfather had passed away just before Tom and I were married and at the time my grandma was nearing the end of her over 10 year battle with it. I hated what this disease had done to my family. I hated what it taken away from me. Having to ever personally experience this disease was one of my greatest fears. I never wanted to do to my children what I had endured with my grandparents. MRI’s are also beginning to show that diseases like Dementia and Alzheimer’s are also linked to gluten intolerances. Knowing these things may be helping along a disease that I’m already genetically prone to getting was a game changer. If there was ever anything that made it easy to give up all the rolls, croissants, pizza, soft shell tacos, donuts, cookies and soft pretzels…that was it. When I started studying holistic nutrition, the professor was obviously a gluten skeptic. He was a firm believer that wheat was beneficial to us. While there are still skeptics and more studies to be conducted, I was really blown away by the studies discussed here. Particularly the bit at the end. I highly suggest taking 6 minutes to listen to the video. Another double blind placebo study showed that people being given pills containing gluten actually began to develop signs of depression. Which is a pretty clear sign that something is going wrong in your gut when gluten gets there. Even in a small capsule form. Now, while I am a firm believer in the placebo (or nocebo) effect, because I had experienced these problems before I believed gluten to be the problem, I am an even stronger believer that there is just something not cool about gluten when I consume it. There is also a great book called, Grain Brain that is highly informative and focuses more on the mental side of things. That scary experience I had in the car reminded me very much of what my grandma must have been experiencing when her Alzheimer’s first started to take hold. Even if it meant giving up all my favorite rolls, donuts, pastries, pizzas and desserts to avoid the same fate, that was okay by me. Now, at the time, I didn’t have a full grasp of all the foods that contained gluten so I just stared steering clear of breads and foods that had breading on them. That seemed easy enough. My stomach would continue act up again and it was so discouraging. Had I gotten all these things wrong? Was there more than one problem? Feeling like I was running out of willpower, I started to research more. Gluten was hiding in way more foods than I was aware oft. Often times, it hides itself in processed foods (especially a lot of vegan and vegetarian friendly ones) but also in sauces, like soy sauce. By this time I was already steering clear of many processed foods. I was, however, making rice and veggie stir fries that included: soy sauce. When I realized my stomach upsets occurred only after meals that contained soy sauce, I was convinced that gluten really was to blame and I quit cold turkey. An elimination diet is currently the only known way discover whether or not you have a gluten intolerance. Tests can be done to check for Celiac’s Disease. If you believe that’s what you may be suffering from, continue to eat gluten before seeing your doctor. The Celiac’s test must be done while you are still consuming gluten. Because I wasn’t having any IBS symptoms, I did the gluten elimination diet. This means removing all gluten from your diet. Any elimination diet can lead to temporary withdrawals that may confuse you and make you believe you are on the wrong track. Chances are you will feel tired, sluggish and low on energy. These symptoms could last for a week or so while your body adjusts to the changes. Do your best to maintain a clean, heavily plant based diet if possible. Yes, there are gluten free alternatives out there, but during the elimination diet I highly suggest avoiding as much processed foods as you can. As I mentioned earlier, processed foods are really not any healthier of an option because they can still lead to leaky gut. Never fear, there are plenty of cleaner gluten free alternatives. What difference did it make for me? Now I realize, even if I overindulge when going out to eat, the feeling of being full has taken on a whole different meaning. It is far less uncomfortable and my stomach doesn’t bloat out so easily anymore. I will not lie, I love going to bed with a flat stomach at the end of the night. My entire life I thought everyone went to bed at the end of the day feeling heavy, bloated and uncomfortable. I just assumed it was what happened after consuming our 3 daily meals. Tom probably appreciates that this doesn’t happen any more as well. He experiences a lot less of the “I feel fat.” nightly chit chat. I’m not saying everyone should expect to go to bed with rock hard abs, (because I sure as hell don’t.) But, not putting all my focus toward the discomfort in my body has given me so much peace I can’t even begin to explain it. I feel far more confident when I don’t have icky stomach feelings distracting me. I wake up happy and I stay awake. I am now better able to wake up, keep up and accomplish all the things I want for myself. I wake up earlier than the rest of my family, greet them with a smile when they wake up, make breakfasts for everyone, head to work the days I work at the preschool, get to the gym more consistently and just all around handle my life with more peace and grace than I was ever able to muster before. I am almost begging you, if you feel off in your body in any of these areas, try eliminating gluten from your diet for 2 weeks and see if it might be behind your discomfort. While it is hard giving up all the goodies gluten is a part of, the quality of life you could experience without it doesn’t even compare. Besides, there are so many gluten alternatives to get your hands on these days, it’s barely even something you have to worry about. As I clearly stated before and will say again, substituting gluten for highly processed foods is not the way to go. There are a lot of cleaner alternatives. I have a few recipes on my Cut the Crap Recipes page as well as a few top notch recommendations in my post: Gluten Free Shopping List. If cutting gluten while staying clean is a cause for concern for you, they are definitely worth checking out! Feel free to message me with any further questions. I know this can be a tough journey to get started on. I have a few recommendations for those of you who may want additional help while starting a gluten free diet.